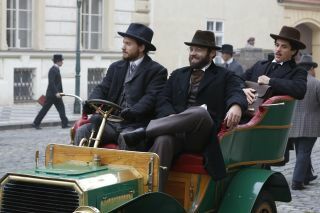 Albert Einstein's friends and classmates Marcel Grossmann (played by Jon Fletcher) and Michele Besso (Seth Gabel) take young Einstein (Johnny Flynn) for a ride in Episode 3 of National Geographic's "Genius." Albert Einstein isn't the only scientist fighting for professional recognition in the latest episode of Nat Geo's "Genius." History widely credits the German-Dutch engineer Wilhelm Röntgen with the invention of the X-ray. But he made the Nobel Prize-winning discovery using a cathode ray tube invented by the Hungarian physicist (and Nazi sympathizer) Philipp Lenard, who hopes to reclaim the rights to the discovery in Episode 3. Michael McElhatton plays Dr. Philipp Lenard and Silvina Buchbauer plays his wife, Katharina Lenard, in National Geographic's "Genius." While Lenard gets territorial over X-rays, young Einstein attempts to prove himself worthy of a job shortly after earning his diploma. In an unexpected act of sabotage, Einstein's physics professor and mentor, Heinrich Weber, hands out "unfavorable" letters of recommendation to potential employers. Poor Einstein just can't seem to catch a break as his pregnant, long-distance girlfriend Mileva Marić grows increasingly impatient with his lack of income. That he still hasn't "put a ring on it" certainly isn't helping the situation, either. Making every effort to earn some cash for his new family, Einstein starts tutoring students. But when he strays from a simple algebra lesson to indulge his young students with lessons on the ether, "hypothetical" atoms, quanta of light and other mysteries of the universe, he gets fired from his very first tutoring gig.